The station wagon was once a staple of the American family, but with the arrival of minivans and crossovers, they slowly thinned out. Subaru, however, has remained one of the few non-luxury automakers hanging onto this people-hauling relic with its off-road-ready Outback. In 2018 the Regal TourX wagon arrived to give families an alternative to the high-riding Subaru. Which is better for our Saginaw area shoppers? Find out below. The Buick Regal TourX debuted along with the sixth-generation Regal lineup in 2018. The 2019 Regal TourX boasts a striking European look that most eyes can’t help but stare at with its shaped-by-the-wind silhouette combined with sharp character lines. Even in its base trim, the 2019 Regal TourX looks nearly like a luxury car. The 2019 Subaru Outback is four model years removed from a redesign, so it is still modern enough but due for a refresh soon. The Outback is more off-road ready than the Regal TourX, and that’s immediately recognizable with its big ground clearance advantage and more upright body. The 2019 Regal TourX is significantly larger than the Outback in every measurement except height and ground clearance. Inside, the Buick Regal TourX shows off its sub-luxury status with an interior that starts off premium enough in its base trim but tops out with luxury-car-like amenities at a relatively low price. Beyond its features, the 2019 Regal TourX just looks more upscale with its large infotainment screen, limited buttons and knobs, wide center console, and premium trim options. 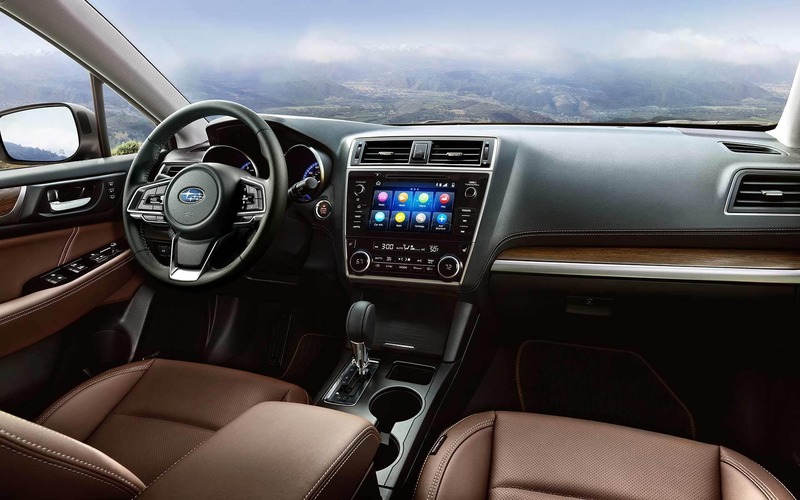 The 2019 Subaru Outback brings things back down to earth with its more straightforward cabin that few will mistake for a luxury car in its base trim. As you move up the trim-level ladder, though, the Outback gains a slew of premium materials and features that make it feel more luxurious, but it never reaches the near-luxury level the Regal TourX does. 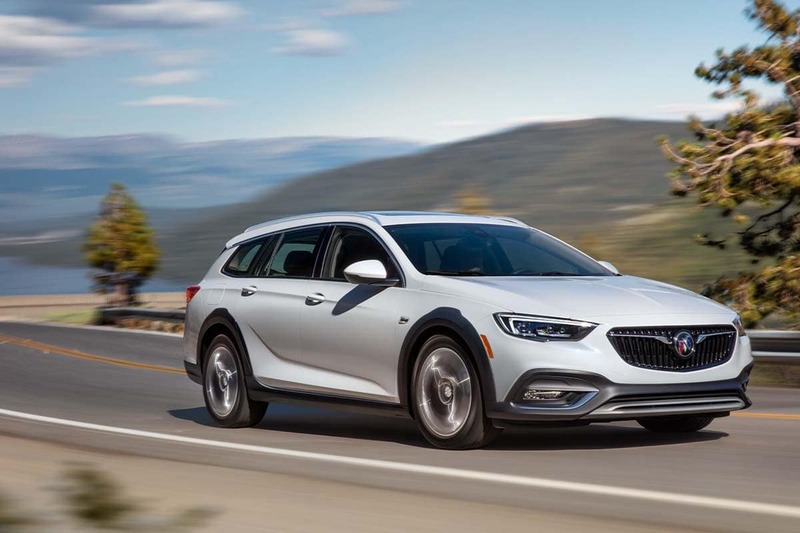 In terms of features, the Buick Regal TourX starts with a slew more features and tops out with luxury-like amenities like an in-cabin ionizer, ambient lighting, premium leather seats, and more. The Subaru Outback starts with simpler amenities, but it makes up for that with standard safety goodies like automatic emergency braking. Though it has a larger body, the Buick Regal TourX’s interior is tighter than the Outback’s in every measurement except rear headroom and maximum cargo room. Unless you’re looking at a German luxury car or al older muscle car, wagons rarely offer much in the performance arena. 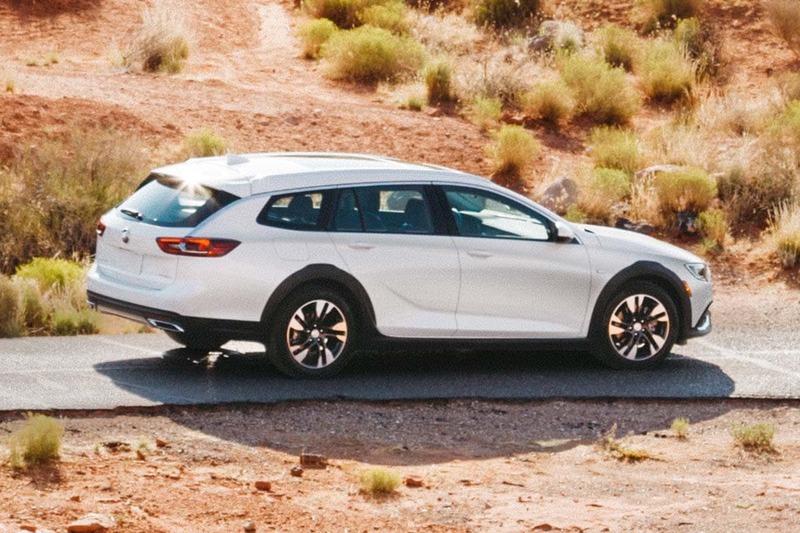 Well, the 2019 Buick Regal TourX will surprise you with a 250-horsepower 2.0-liter turbocharged four-cylinder that sprints it to 60 mph in 6.3 seconds. Plus, it can handle light off-road driving with its standard all-wheel drive. 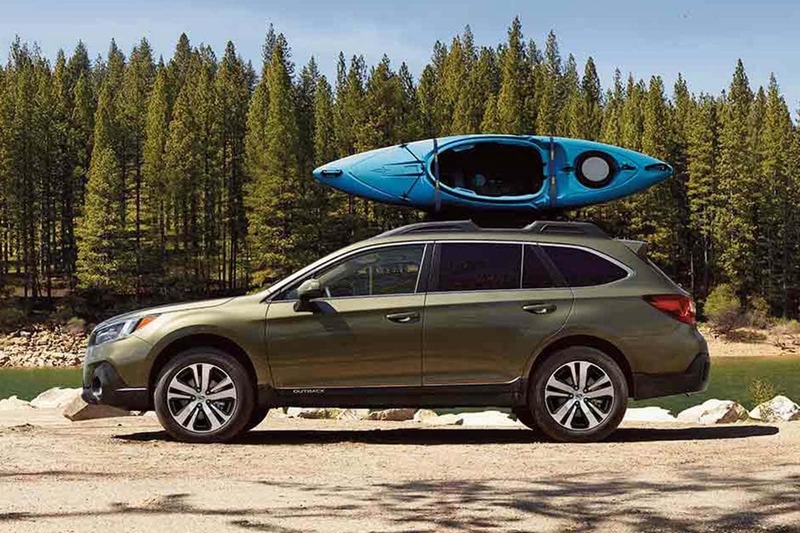 The 2019 Subaru Outback is more traditional in the performance realm, as its base 175-horsepower 2.5-liter engine takes a full nine seconds to get it to 60 mph. The optional 3.6-liter six-cylinder engine that delivers 256 horsepower is a little better at 7.1 seconds to 60 mph, but it has a healthy fuel appetite. Though you likely won’t buy a wagon for its towing prowess, the Outback can haul 1,700 pounds more than the Regal TourX at 2,700 pounds. The Buick Regal TourX is available in just three trim levels: Base, Preferred, and Essence. Their starting prices range from $29,995 to $35,995. The 2019 Subaru Outback has six trims — 2.5i, 2.5i Premium, 2.5i Limited, 3.6R Limited, 2.5i Touring, and 3.6R Touring — and their starting prices range from $26,345 to $38,995. Who Should Buy the Buick Regal TourX? Buyers who really want the look and feel of a German luxury car but not the payment are the perfect buyers for the 2019 Buick Regal TourX. It delivers a near-luxury design and features list at a price starting under $30,000. 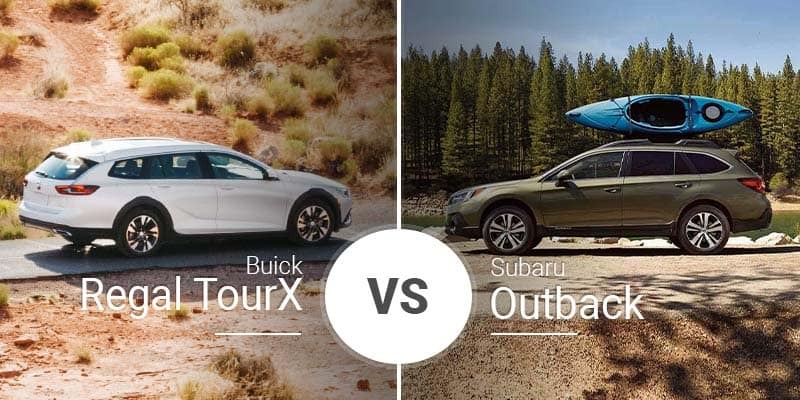 Who Should Buy the 2019 Subaru Outback? Do you often find yourself deeper into the trails than you expected to go, or are you just an avid outdoorsman who needs a more rugged vehicle? 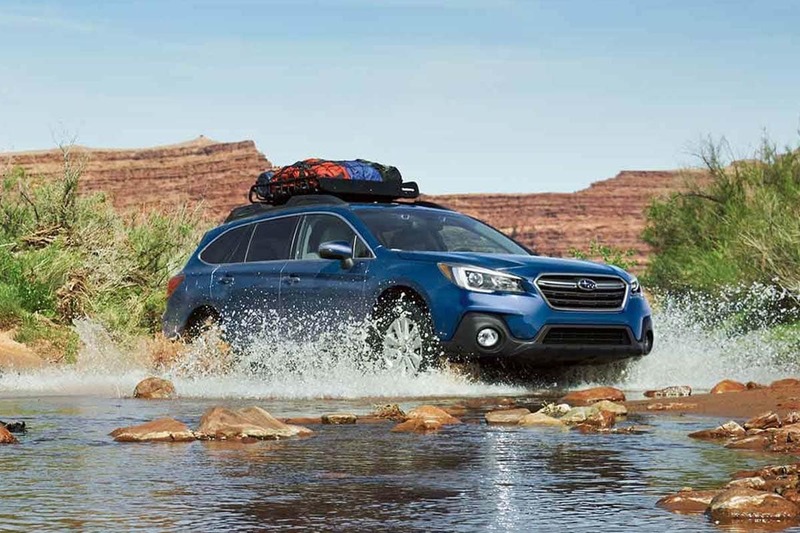 If so, the Subaru Outback is a great option to get you through your next adventure. Get your to-do list done in style with the 2019 Buick Regal TourX. See what it offers you and your family by test driving the Regal TourX at Garber Buick serving the Saginaw and Bay City Areas. Whether you need it to haul the kiddos to school in Midland or run errands around Saginaw, the 2019 Regal TourX has the space, speed, and looks you crave. If you can’t make it to our Midland area showroom for a test drive today, you can navigate to our online inventory page to see what our Saginaw dealership has in stock and choose the 2019 Regal TourX model that suits you.